friendly experts, Wildlife Safari can design a custom-made journey or luxury safari through Africa to suit your personal requirements. 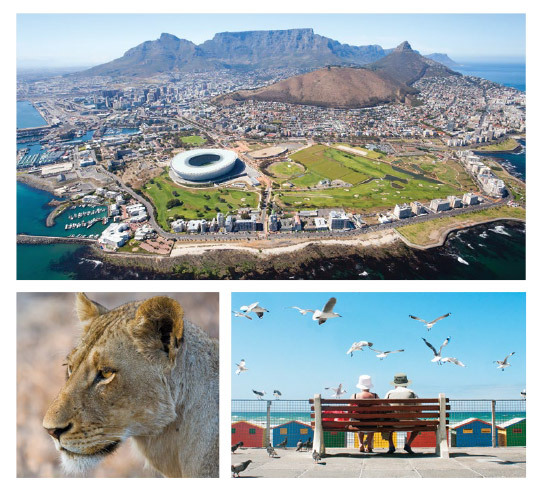 The Best Spots in South Africa featured in this brochure represent only a sample of the exclusive holidays Wildlife Safari offers. If you have special requests, ask Wildlife Safari to custom-design the holiday of your dreams. Escape to Cape Town, one of the most beautiful, cosmopolitan cities in the world. Take a leisurely 6 day Garden Route Journey with an expert private guide staying at small unique hotels and Grootbos Private Nature Reserve with sightseeing excursions or ask Wildlife Safari to custom-design a self drive journey. Stay at the iconic Palace of the Lost City Hotel in Sun City, a slice of Vegas in the bushveld.. Experience South Africa’s wildlife at a luxury lodge with all game viewing activities and an experienced guide. Indulge in a journey with Rovos Rail, the most luxurious train in the world. Take a Joburg Jaunt to the city of gold, a buzzing contemporary city. Wildlife Safari has created a selection of luxury, all-inclusive escapes offering exceptional quality with unbeatable value and service. Visit the best game-viewing locations, staying at hotels, safari lodges and camps with outstanding amenities and service. With more than 40 years' experience, an impeccable safety record, guaranteed departure dates, fantastic personal service, the best selection of hotels, lodges and camps, custom-built 4WD vehicles, top African guides, unlimited game viewing, nature walks, unique meals and special highlights… what more could you want? Wildlife Safari also custom-designs private journeys throughout Africa, offering a flexibility that comes with the advantage of nearly 40 years of safari experience. Wildlife Safari's consultants would love to help you plan your perfect safari to Africa or the surrounding islands of the Indian Ocean. Wildlife Safari is one of Africa's most experienced and respected safari companies, offering holidays, service and value second to none. Wildlife Safari remains family owned and managed and takes pride in providing "old fashioned" customer service so that every detail of your journey is taken care of. Guaranteed departures for all "Signature Safaris"
People who ordered Best of South Africa also ordered the free travel brochures below. Click on the images to find out more about these brochures.